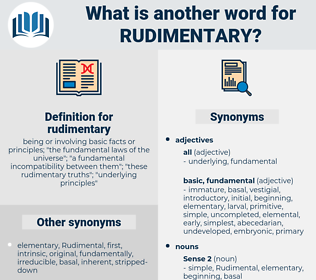 What is another word for rudimentary? being or involving basic facts or principles; " the fundamental laws of the universe"; " a fundamental incompatibility between them"; " these rudimentary truths"; " underlying principles"
rough, preliminary, simple, minimum, initial, makeshift, essential. basic, austere, crude, low-tech, improvised, fundamental, primary, elemental, homemade, rustic, minimal. derivative, difficult, nonessential, complex, additional, intricate, complicated, developed, extra, advanced, sophisticated. In contrast with Miss Burns, Frederick perceived in Ingigerd with fearful clearness that incompleteness which is eternally rudimentary. His work is for the most part destitute of the most rudimentary notions of decency, but it is apparently produced in good faith and with no evil purpose.